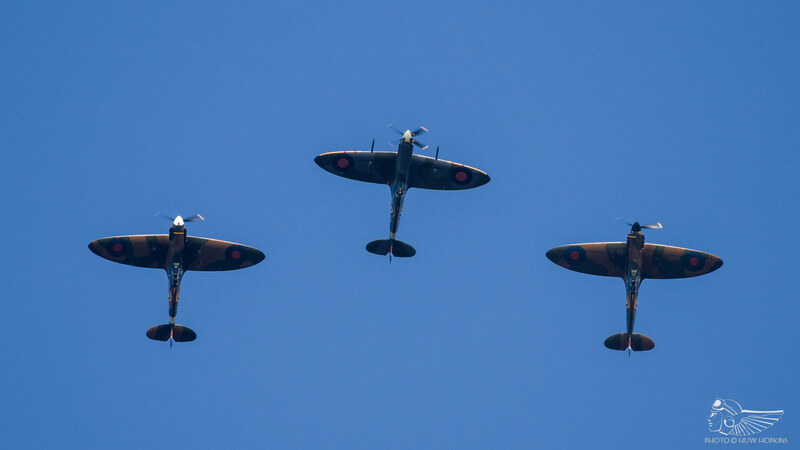 IWM Duxford’s Battle of Britain 75th Anniversary Air Show in September 2015 featured a monumental 17 Spitfire finale. Brian Smith, the architect of the sequence and the formation leader, offers his impressions of planning and executing the routine. 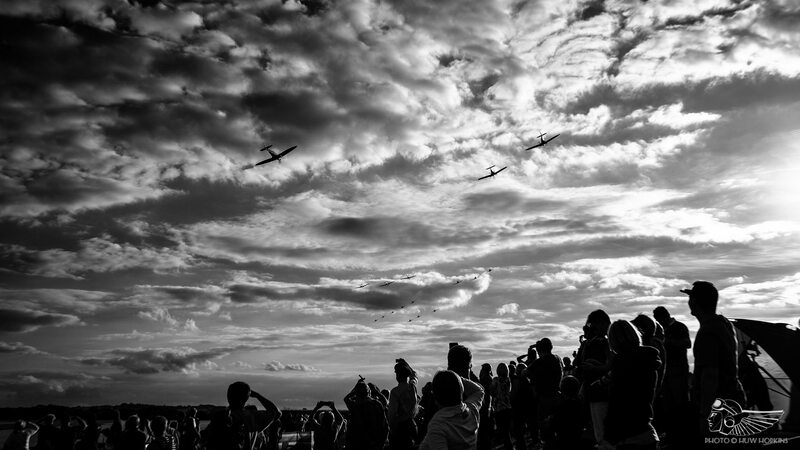 “It’s been a huge year as people well know, and with it being Duxford and the last major airshow of the season, I wanted to try my best to deliver a major spectacle and bring the whole thing to a fitting close”, explains Brian Smith, orchestrator of the 17 Spitfire finale to the Imperial War Museum (IWM)’s sold-out Duxford Battle of Britain 75th Anniversary Air Show. Brian’s credentials in this field speak for themselves. A purveyor of vintage piston aeroplanes for over 40 years, he and Flying Display Director Jeanne Frazer have between them organised, choreographed and led the largest Battle of Britain commemorative flypasts and displays the United Kingdom has seen at five year intervals from the turn of the century. Sea Wings 2000 over Southampton Water gathered 12 Spitfires and a single Hurricane for the climactic sequence of that event, whilst major gatherings at IWM Duxford in 2005 (a forgotten gem) and 2010 (widely acknowledged as one of the best warbird set-pieces in recent European airshow history) had included Spitfires to the number of 13 and 16 respectively. Furthermore, the Battle of Britain 75th anniversary commemorations throughout summer 2015 delivered a series of tremendous aerial events up and down the country, including large-scale public displays and flypasts at the Royal International Air Tattoo, Humberside, Biggin Hill and Goodwood, with the latter drawing an unprecedented 25 Spitfires and six Hurricanes to the Sussex aerodrome on 15 September, just four days before Duxford’s airshow. 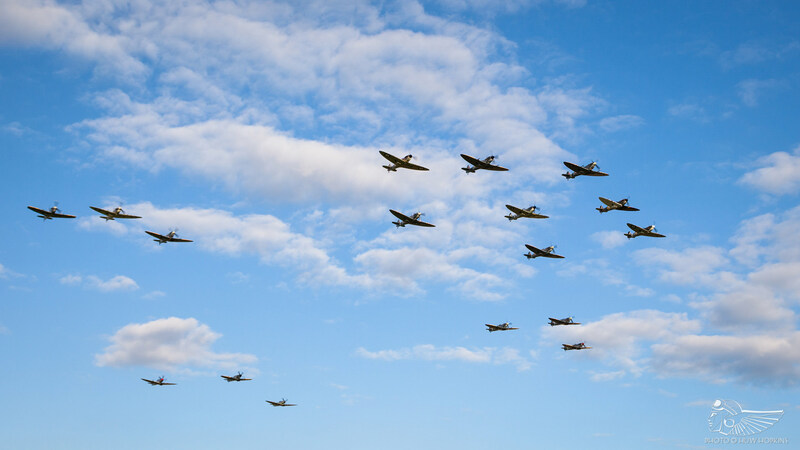 Needless to say, there were particularly lofty expectations for the Battle of Britain 75th Anniversary Air Show, the last of the year’s big commemorative events. 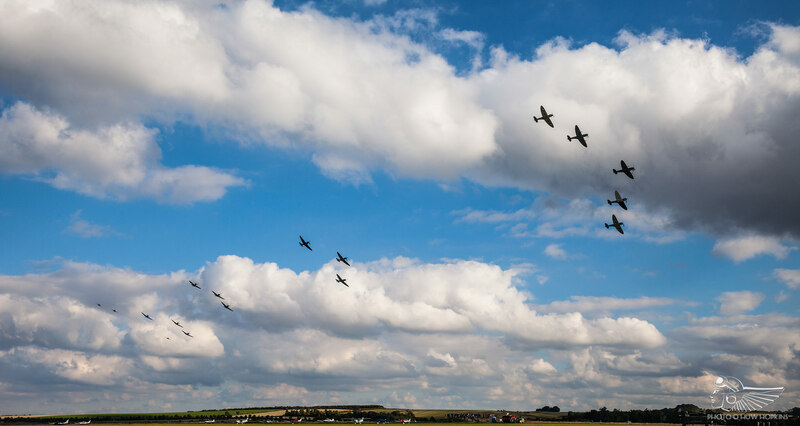 Planning for Duxford’s tribute began in earnest following the conclusion of the September 2014 event which, buoyed by one of the last appearances by the Avro Lancaster pair, had drawn sell-out crowds on both days. Initial planning meetings between the IWM and Jeanne Frazer decided on a logical Battle of Britain theme, the idea broadly being to deliver a finale befitting of the occasion. To that end a considerable budget was set to accommodate up to 20 Spitfires for the climatic set-piece in the three and a half hour flying programme, with Brian once again positioned to lead the whole thing. Brian takes up the story: “Jeanne got onto me and proposed a re-run of 2010, and it went from there. I still had all the paperwork for it so there was no issue in terms of starting from scratch.” To his mind, there was only one aircraft that could – should – lead the formation: the Old Flying Machine Company (OFMC)’s Duxford-based Spitfire LFIX MH434, a combat veteran intimately linked to Duxford and one of the world’s most historic Spitfires, having enjoyed a long association with distinguished luminaries of the aviation world including the late Neil Williams, Ray Hanna and his son Mark. “I spoke to Sarah Hanna and said it would be essential in my view that MH434 should lead it. There was an unequivocal ‘yes’ and she allocated the aeroplane to me for the weekend – the last thing I wanted was to be unsure of what aircraft I’d be sitting in. Participation booking for the Spitfire gathering began in earnest with the commitment of the 11 Duxford-based aeroplanes from OFMC, The Fighter Collection (TFC), Aircraft Restoration Company (ARCo), Historic Aircraft Collection (HAC), Historic Flight Foundation (HFF, visiting from the USA for the Summer), Keith Perkins and the IWM itself, before additional aircraft (including two Seafires) from other bases – provided by Spitfire Ltd, Air Leasing, Boultbee Flight Academy, Martin Philips and Kennet Aviation respectively – were scheduled to appear. While the constantly evolving historic scene naturally brought about fluctuations to aircraft numbers in the months preceding the airshow, sourcing suitably qualified pilots to accommodate each position within the formation was an equally important consideration and one which brought about a whole new raft of challenges. Experienced key players such as John Romain, Cliff Spink, Charlie Brown, Pete Kynsey and Stuart Goldspink were involved almost from the outset and went on to occupy section leader positions on 19-20 September. Early knowledge of their involvement allowed Brian to structure the sequence to broadly ensure that those with the most experience were positioned accordingly within the formation, only making the final decision on exact placing within the sequence immediately before the airshow itself, once the final list of aeroplanes and pilots was confirmed. 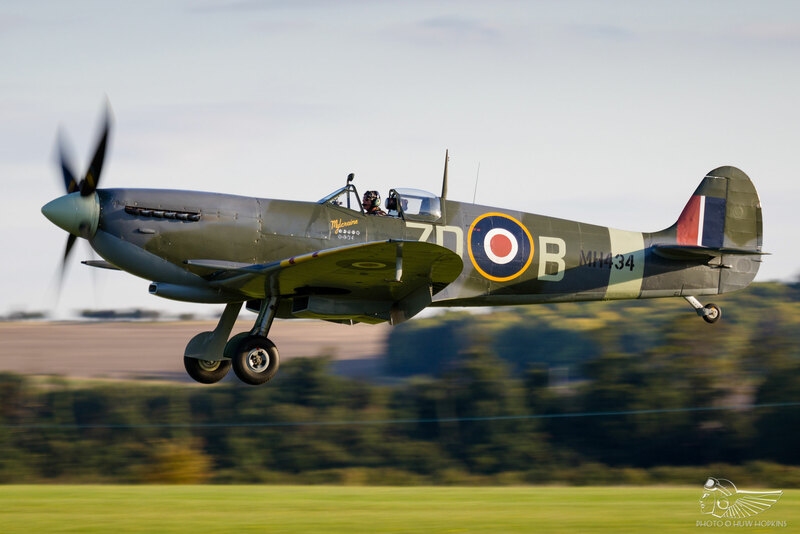 The Comanche Warbirds Ltd Spitfire Mk.Ias (under the care of TFC at Duxford) presented an issue insofar as pilots were concerned, with only a handful of British aviators – Brian included – insured to fly the aeroplanes.  With Paul Bonhomme scheduled to fly one of the pair, and Pete Kynsey rostered to fly Air Leasing’s Seafire LFIII, a potential gap was filled when American owner Dan Friedkin (of Horsemen Flight Team fame) joined the ranks. Similarly, two of the Spitfires were to be flown by relative newcomers Chris Hadlow and Matt Jones. “Both of the nominated pilots are experienced, but haven’t done a lot of this kind of thing. They tick all of the boxes but you get to the briefing and their jaws hit the floor! A distinctly autumnal mist clung to the Chiltern Hills early on Saturday 19 September, dispersing rapidly as the sun grew stronger. 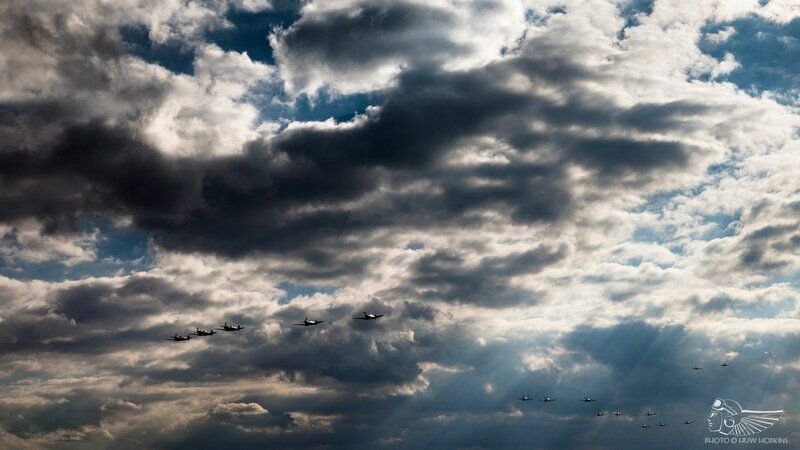 By late morning, a sold-out Duxford was bathed in intermittent warm sunshine that would later break completely into wall-to-wall blue; this was the backdrop against which Brian’s Battle of Britain tribute would unfold. In a break from tradition and as a means of ramping up the anticipation, the Spitfires were allocated a dedicated slot of ten minutes or so for their start-up and take-off; they would be uninterrupted for the duration of their slot, save for the subsequent ‘joker’ routine provided by B-17 ‘Sally B’ on Saturday and HAC’s Hawker Hurricane Mk.XII on Sunday. Given the range of Spitfires participating – almost the entire airworthy lineage was present, from the single radiator Mk.Is to the Griffon engine later marks – the four Griffon examples taxied to hold on the hard runway long before the early variants, with their tendency to overheat on the ground, fired up and positioned on the grass runway. This ensured no one was left running hot in a ‘We either stand down or blow up’ situation, particularly the two Comanche Mk.Ias which had flown an exquisite aerobatic sequence earlier in the afternoon. 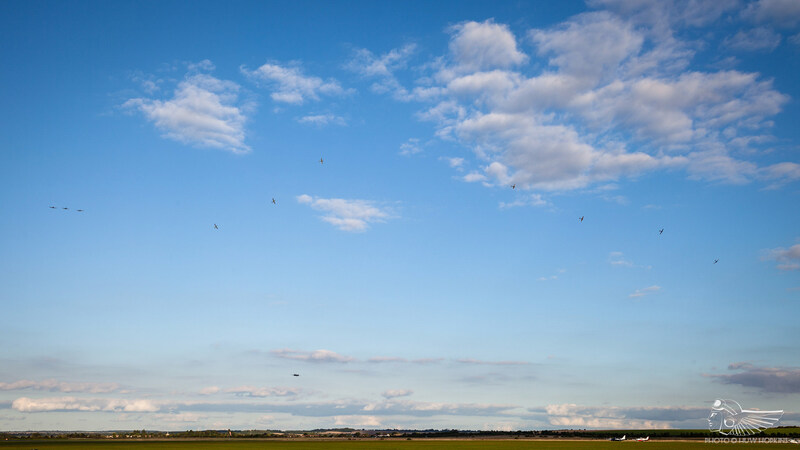 “It helps matters in terms of forming up,” says Brian, “because you don’t have aeroplanes scattered all over Cambridgeshire – there’s less of a catch-up for the latter sections. I normally allow ten to 15 minutes to form up but what is normally a fairly arduous, drawn out requirement to get everybody together just came together very quickly, perhaps as a function of people having been up to speed from earlier in the season.” For the spectators on the ground, meanwhile, the rush of 17 aeroplanes thundering into the air delivered tremendous visual and aural impact – you could feel the sense of occasion. With the lengthy formation segment complete, the second half of the sequence began to blossom. 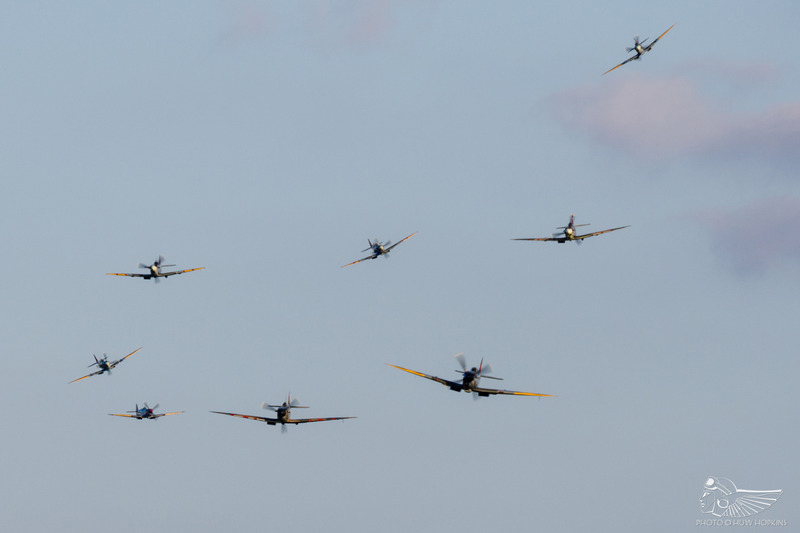 Brian’s Blue section split, with his three-ship pulling up and out of the formation whilst the six aircraft of Yellow and White sections, with Pete Kynsey in the Seafire LFIII at the head of the pack and the Griffons – who are “better off doing their own thing as a golden rule, with bigger patterns and higher energy” – bringing up the rear, peeled off to the north. Remnants of Blue section, meanwhile, joined Green and Red to the south, flying a streamed tail-chase centred over the hard runway. Brian’s careful choreography was executed to perfection by the 17 pilots, the sky filled with wheeling, climbing and diving Spitfires. The spectre of the Shoreham Airshow tragedy hang over the British airshow scene at the time and Duxford was under particular scrutiny from the CAA in light of its close proximity to the busy M11 and A505 roads. Indeed, restrictions placed on air displays at the aerodrome were such that the entire Spitfire finale was put under threat at the eleventh hour; thankfully, common sense prevailed and adjustments were made to ensure that the authorities were satisfied. One such change was the decision to place the six aeroplanes over the grass runway into a ‘race track’ pattern, whereby they carried out flypasts over the airfield before climbing and turning north (meaning they were climbing high over the offending M11/A505 junction), repositioning behind the crowd to dive in over the western shoulder, again maximising height between the aircraft and the A505. After a series of formation passes and loops at higher altitude, Brian and MH434 broke to the north (“heading for the fabled bike sheds”) to keep watch over the various elements. “When you’re in the thick of it, it’s difficult to keep track of time,” he says, “and whilst tail-chasing you don’t want the section leaders to be distracted. For that reason I call off each section at the appropriate moment and as one section is on the base leg to land, I call the next off.” With the sky emptying, Brian brought his Spitfire back over the field for several minutes of solo aerobatics to round off the sequence, putting a fitting exclamation mark on the whole thing and allowing spectators a few moments of reflection. “It’s like a piece of music, really. It starts off at an easy pace, builds to a crescendo and then dies down and finishes on a pleasant but controlled note. “You get so involved in it, it’s not until afterwards that you think about it”, he continues, reflecting on the scale of the whole endeavour. “It’s in the aftermath that you take stock. Personally, I just sit down under the aircraft and take a few minutes to reflect. On the Sunday of this year, I thought it was just about as good as it could be”, concludes Brian.